Eschew the tourist crowds and head to Yes Snowboard School and DOSIO VIGNETI. Explore Turin's surroundings by going to Marziano Abbona (in Dogliani), Azienda Agricola Fratelli Aimasso (in Diano d'Alba), La Morra (Azienda Agricola Elio Altare & Agricola Gian Piero Marrone) and Isolabella della Croce (in Loazzolo). It doesn't end there: wander the streets of Quadrilatero Romano. For maps, more things to do, where to stay, and other tourist information, read our Turin sightseeing planner. Sydney, Australia to Turin is an approximately 31-hour combination of car and flight. Traveling from Sydney to Turin, you'll gain 9 hours due to the time zone difference. Plan for colder temperatures traveling from Sydney in December, with highs in Turin at 10°C and lows at 1°C. Finish your sightseeing early on the 25th (Sun) so you can travel to Greve in Chianti. Step off the beaten path and head to Agricola Tamburini Emanuela and Terre di Perseto. Explore Greve in Chianti's surroundings by going to Barberino Val d'Elsa (Castello della Paneretta, Castello di Monsanto, & more). To find where to stay, reviews, maps, and more tourist information, go to the Greve in Chianti custom trip planner. Getting from Turin to Greve in Chianti by combination of train and bus takes about 4 hours. Other options: drive; or do a combination of train, flight, and bus. December in Greve in Chianti sees daily highs of 13°C and lows of 3°C at night. Finish your sightseeing early on the 29th (Thu) so you can drive to Venice. 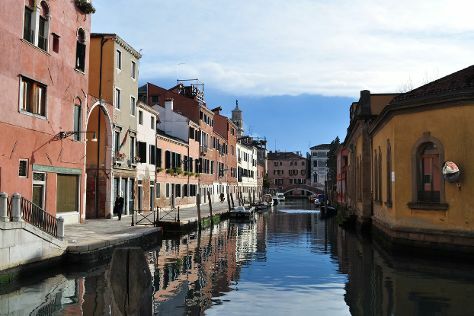 Take a break from the city and head to Canal Grande and La Giudecca. Kids will enjoy Lido Beach and Ponte di Rialto. Explore Venice's surroundings by going to Casa Geretto - Vino Dal 1953 (in Santo Stino di Livenza), Romeo Lazzarotto (in Lorenzaga), Savian Vini (in Annone Veneto) and Cantina Molon Luigino (in San Dona Di Piave). Next up on the itinerary: do a tasting at Cantina Marco Polo 6811, look for gifts at Oreficeria Boscolo Gioie, wander the streets of Dorsoduro, and take in the architecture and atmosphere at Basilica di Santa Maria della Salute. To see ratings, where to stay, maps, and other tourist information, read our Venice itinerary planner. Traveling by car from Greve in Chianti to Venice takes 3 hours. Alternatively, you can do a combination of bus and train; or do a combination of bus and flight. When traveling from Greve in Chianti in December, plan for little chillier days and about the same nights in Venice: temperatures range from 9°C by day to 1°C at night. Finish up your sightseeing early on the 1st (Sun) so you can travel to Naples. Naples is the capital of the Italian region Campania and the third-largest municipality in Italy after Rome and Milan. Start off your visit on the 1st (Sun): explore the ancient world of Gli Scavi Archeologici di Pompei, wander the streets of Spaccanapoli, and then delve into the distant past at Teatro Greco-Romano. For reviews, traveler tips, where to stay, and other tourist information, use the Naples vacation trip planner. Traveling by combination of bus, flight, and shuttle from Venice to Naples takes 3 hours. Alternatively, you can take a train; or drive. In January, Naples is somewhat warmer than Venice - with highs of 15°C and lows of 6°C. Finish your sightseeing early on the 1st (Sun) to allow enough time to take a train to Rome. Start off your visit on the 2nd (Mon): kick back and relax at Acqua e Sale - Stabilimento Balneare and then soothe aching muscles at some of the top local wellness centers. On the 3rd (Tue), you'll have a packed day of sightseeing: wander the streets of Trastevere, enjoy the sand and surf at Oasi Naturista, and then take in the architecture and atmosphere at St. Clement Basilica. To find more things to do, photos, where to stay, and tourist information, use the Rome vacation trip planner. Getting from Naples to Rome by train takes about 1.5 hours. Other options: drive; or do a combination of shuttle, flight, and train. Expect a daytime high around 15°C in January, and nighttime lows around 3°C. Wrap up your sightseeing on the 3rd (Tue) early enough to travel back home.